RU? 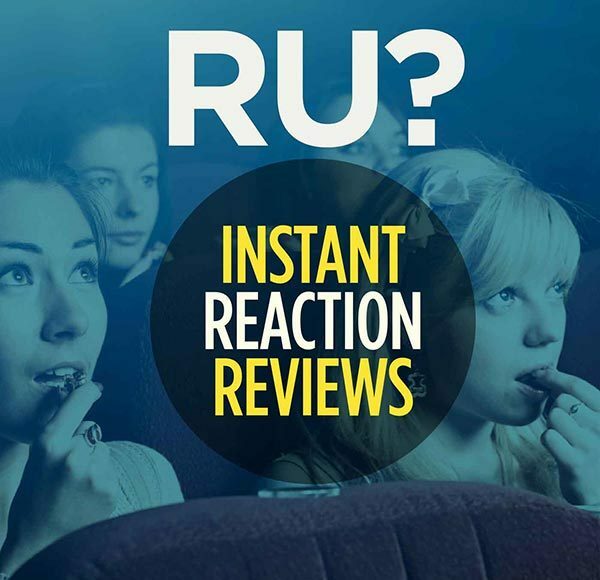 Instant Reaction Review Podcast Ep. 5 - Rating Theory And Preview Of Upcoming Shows - Are You Screening? This week we took a break from actually doing the job we set out to do, because we thought we better do a little housekeeping. Actually, we thought it made sense to give some idea how we come up with ratings, because we have somewhat differing views, and noticed that the subject came up a lot during our review shows. We figured, if we don’t set the stage, then each review show gets eaten up, at least to some degree, by taking the time to say a lot of things we ought to just get out of the way. This way, in the future, we can just point you to this episode. We obviously covered a lot of stuff that has to do with our personal theories on movie criticism, and/or the theories we subscribe to, and we compared our views with those of other critics, especially Roger Ebert, who came up quite a few times. We also talked about lists, and the fact that co-host @Shane_Leonard loves them, whereas I rather despise them. At least, I don’t like having to put them in order. You may not be surprised to learn that we went on for quite a while, despite my making this show 90 minutes. We barely had a chance to give you a preview of the upcoming films we’re going to cover… but we managed it. Give it a listen, and be sure to tune in next week – Sunday, April 29th at 4:00pm est – when we’ll be reviewing The Raven. Also, two quick things I want to mention. 1) I have to give a big thank you to all the listeners and subscribers. Considering how long the show has been around, I’m really impressed with how well it’s doing. Especially if you consider the next day listens we’ve been getting. 2) I’ve launched a forum here at Are You Screening?, and one of the big reasons is – besides the people who have kept asking for one over the years – that I’ve put in a forum so that people can chime in for the upcoming podcasts. A lot of people have already emailed me about not being available to listen to the show live. Frankly, the “liveness” of the show was not initially part of the theory, though we kind of love it now. So, instead of calling in live, or joining the chat that is open live during the show (which we still encourage you to make use of), you can give us your thoughts in the forum, and we will check them before the show goes on. That way, you can still be part of the show, and we’re really looking forward to a bit more involvement from the fans. If you happen to see the film before our show, let us know your thoughts, and we will (possibly) respond on the air. If not, we’d still love to know what you’re thinking about the film, and/or what questions or comments you might have about the film. Ok, those out of the way, check out the show. I’ve included a couple of links that might prove interesting given the discussion. And, please do subscribe either through BlogTalkRadio, or iTunes. In which I take Ebert to task for his ratings of several awful films, including Indiana Jones and the Kingdom of the Crystal Skull. An effort from a couple of years ago, in which I give my same theory that is covered somewhat in the podcast. My 2009 list, which is covered to a degree as an example during the podcast.